Reflective Xinglet SmartPhone Cell Phone Pocket Vest. 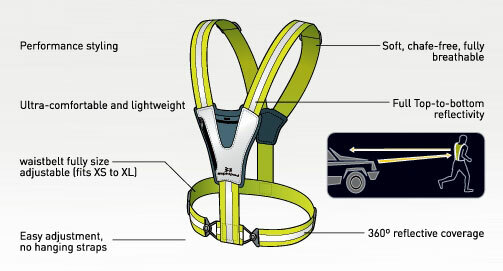 The Xinglet Pocket is a low-profile Amphipod 'strap-system' vest that provides superior reflectivity and high visibility color to ensure safety during early morning and late evening runs. Easily adjusts to fit over shirts, jackets and other heavy outerwear with enough room to move about comfortably, no matter what size you wear. Yes, your iPod will fit snugly in the front pocket! An expandable zippered pocket can hold a wide range of SmartPhones including the iPhone 6 Plus, with multiple top & bottom pocket port holes for headphones.